Due to overwhelming (okay, one) demand, here is the definitive Joel’s Bread Recipe. This recipe went through a lot of changes at first while I was learning, but has gotten to be pretty stable over the past few years and always works out quite well. This post is photo-intensive, and so begins below the fold. It all starts with a bowl of warm water. Exactly how much water will depend on your environmental circumstances, I’m in a high-altitude desert, so don’t be afraid to tinker. I finally settled on 1 5/8 cups. 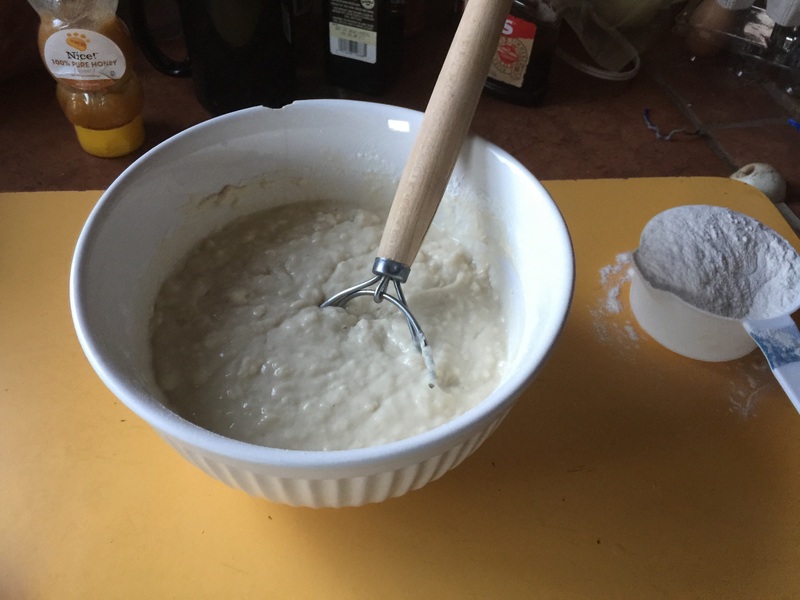 Combine two teaspoons of regular yeast in the warm water with two teaspoons of salt and four tablespoons of sugar, stir and let sit for five minutes or so to proof the yeast. Bubbles should rise, and the water should get all brown and very unhealthy-looking. If the yeast just lies there it’s dead, and further effort will not help. Stir in one egg and a very little oil. Starting gently so as not to make too much of a mess, begin stirring in the flour. Start a cup at a time to form a smooth batter. As the batter firms up and starts to become dough, get more energetic with the stirring but add the flour in smaller increments. Near the end, I’m barely dusting the top of the forming dough ball with flour, whipping it very energetically. 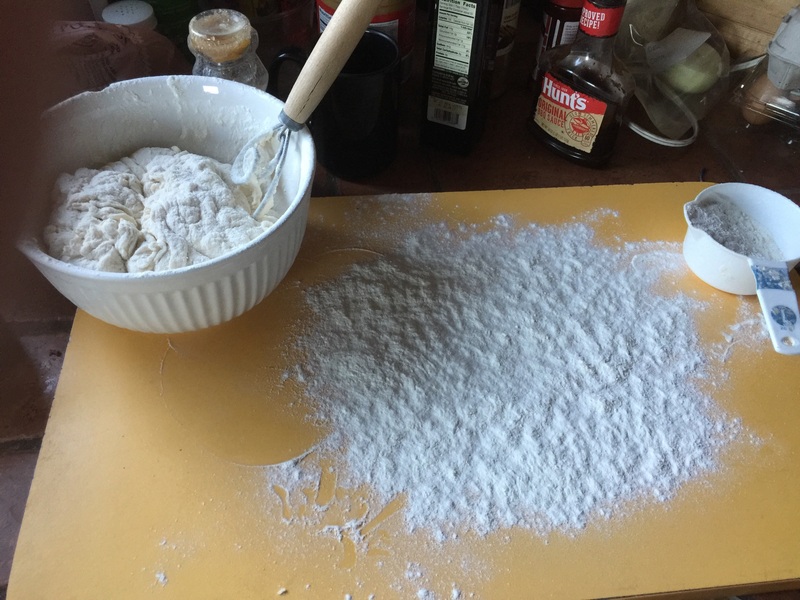 Don’t go crazy with the flour, add it slowly until you get a firm ball that no longer wants to stick to the sides of the bowl. 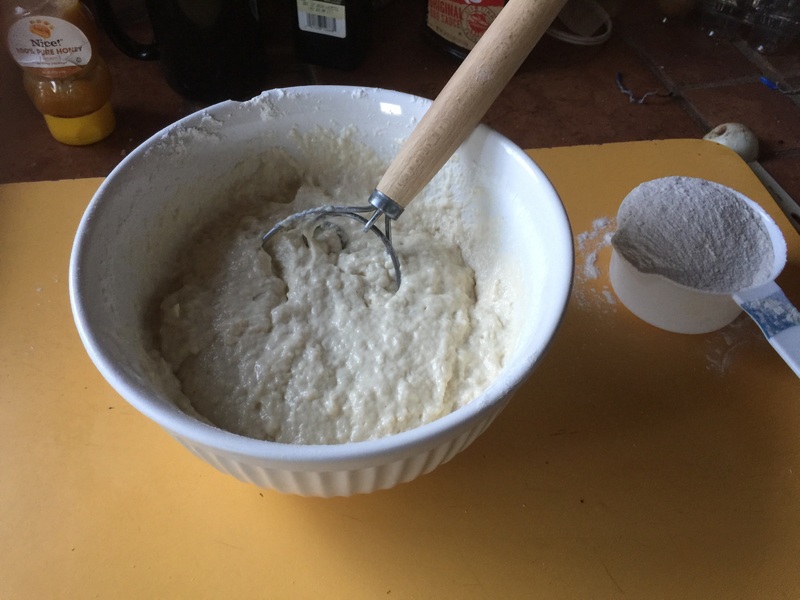 Once you’ve got a dough ball, flour your mixing surface and pour out the ball on the flour. 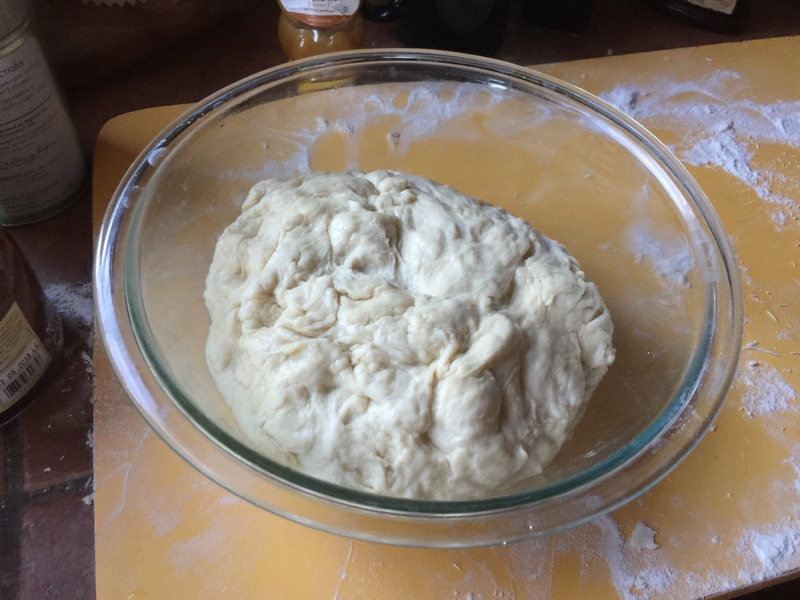 At this point your dough ball will be dry and stringy with bits wanting to fall off. (just stick them back into the ball when that happens.) Now you start kneading. 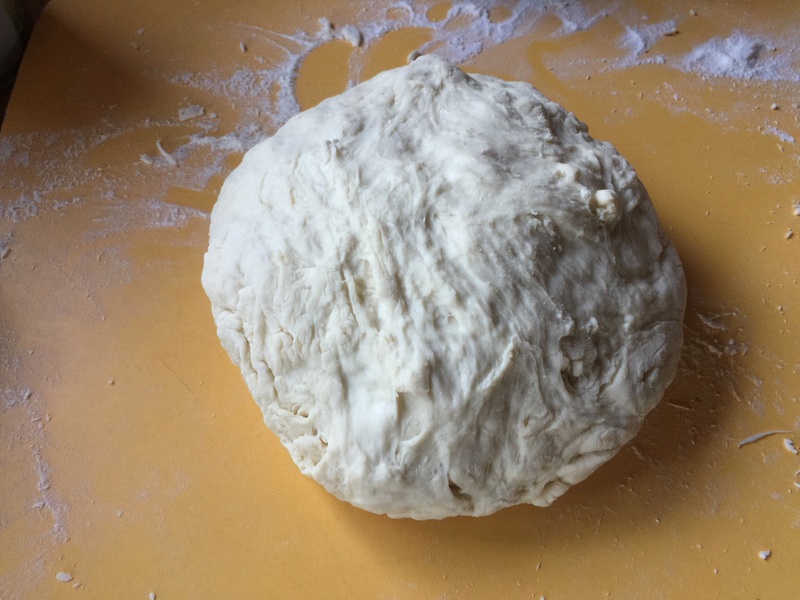 Knead the dough by pressing and folding the ball over and over. Moisture will work its way to the surface, which will become very sticky. Add flour only as necessary, too much flour can ruin the whole thing at this point. 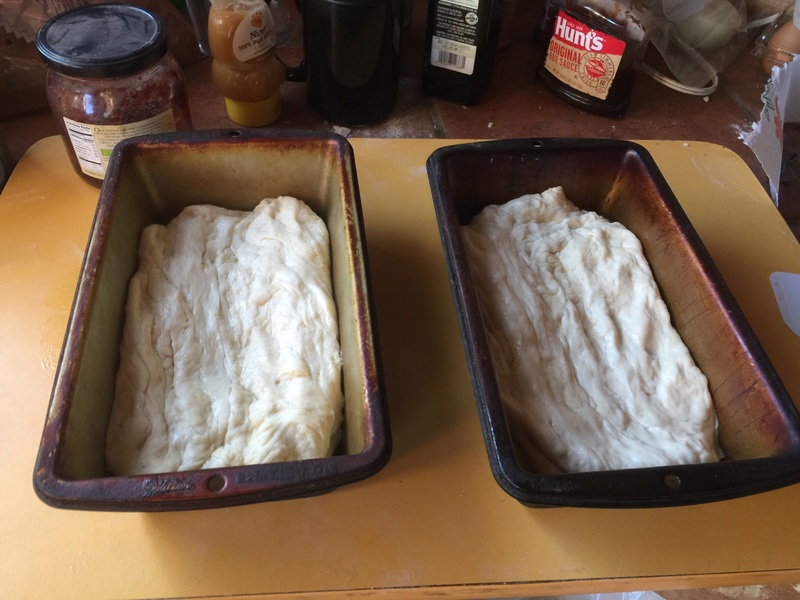 Just keep working the dough – over the course of 7-10 minutes it will probably pick up another cup or so of flour. Determining when you’re done kneading is largely a matter of practice. Hint: It’s not done just because you’re sick of kneading. But what you’re looking for is a moist, solid and homogeneous ball, with an even texture throughout. 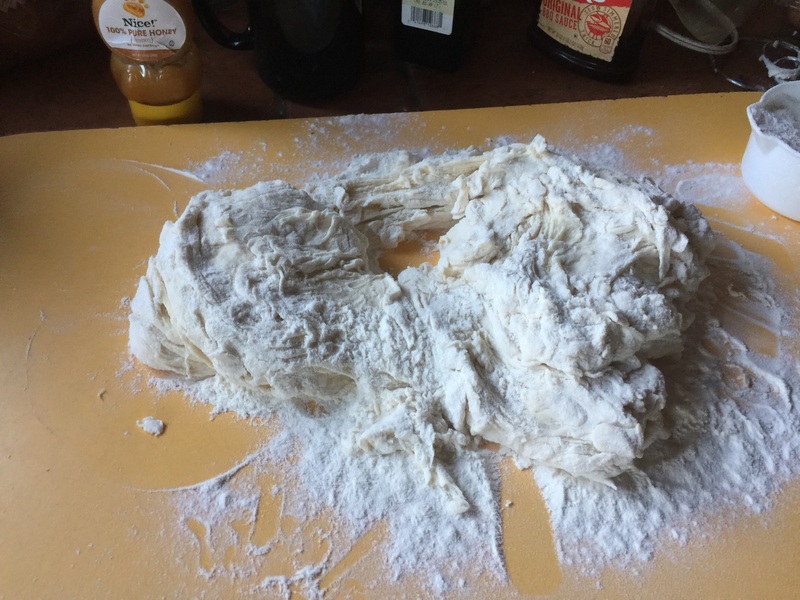 If you have smooth and moist on one side of the ball but dry and stringy on the other, fold the ball to put the dry part on the outside and keep kneading. 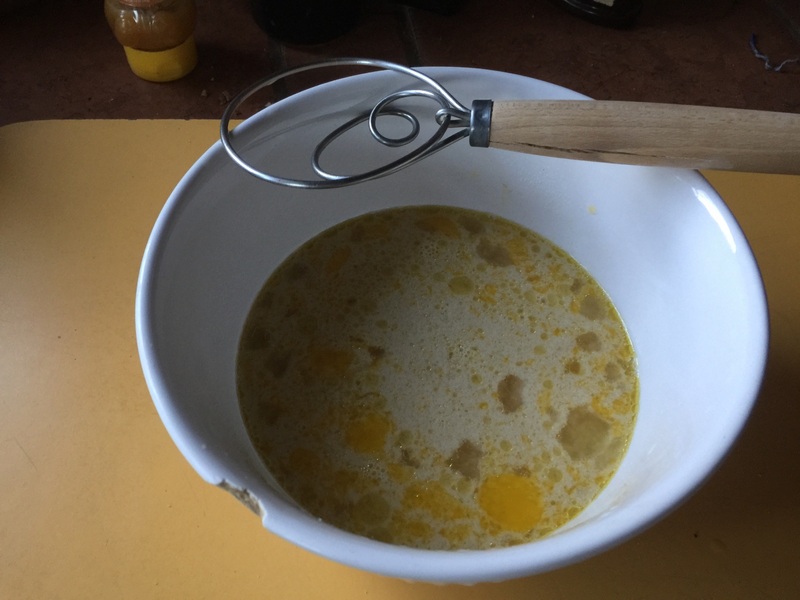 A lot of people use a mixer with a dough hook for this step. Pour a little oil in the bottom of a clean bowl, swirl it around, and drop the ball into it, rolling the ball around so the entire surface is lightly covered. This will keep it from drying out while rising. Cover the bowl with a towel and put it somewhere warm. With mine, it routinely takes about 35 minutes for the ball to double in size. 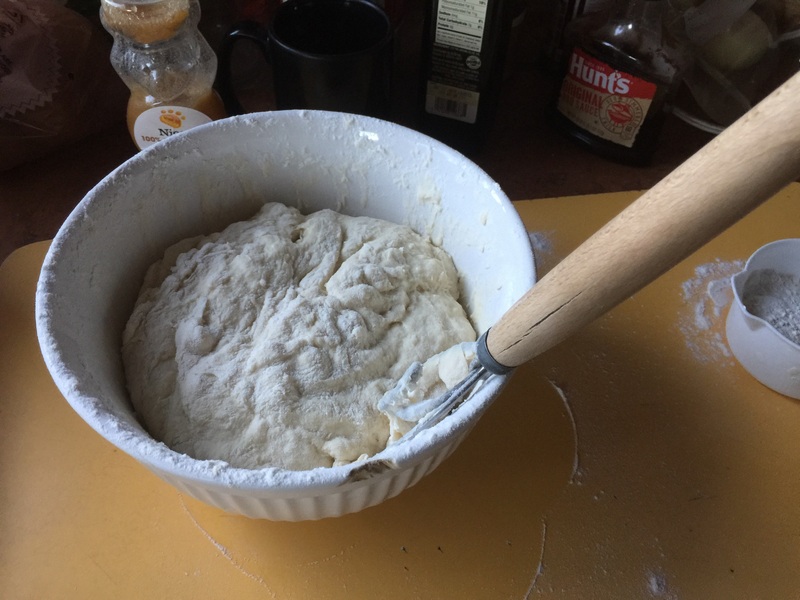 After the first rise, remove the dough ball from the bowl, punch it down, stretch it out, cut it into two equal portions, and punch them down into two greased bread pans. Cover the pans with the towel and put them someplace warm to rise again. Let the two loaves rise till they’ve about doubled in size. Toward the end of that rising, warm your oven to 350o. Pop the loaves into the hot oven and bake for 35 minutes. They should turn nicely brown and give a sort of hollow sound when you thump them, and that’s how you know they’re done. Let the loaves cool thoroughly on a rack before bagging them, or they can get soggy and moldy quick. Delicious! Enjoy! 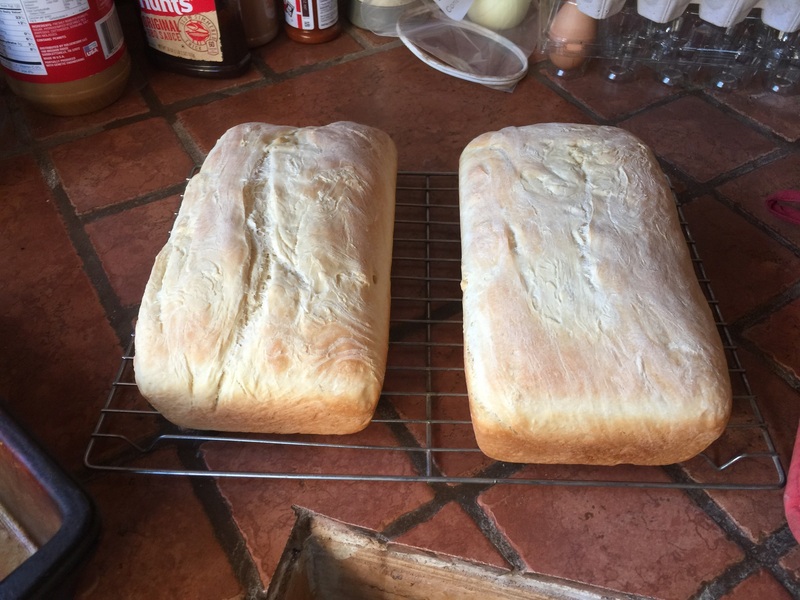 Seriously, once you get used to the work – and it is work – you’ll get quickly spoiled and henceforth storebought sandwich bread will taste like cardboard to you. Just remember it contains nothing remotely like preservatives and must be refrigerated or eaten fresh. Thank you! And also, everyone reading should try Joel’s cracker recipe. 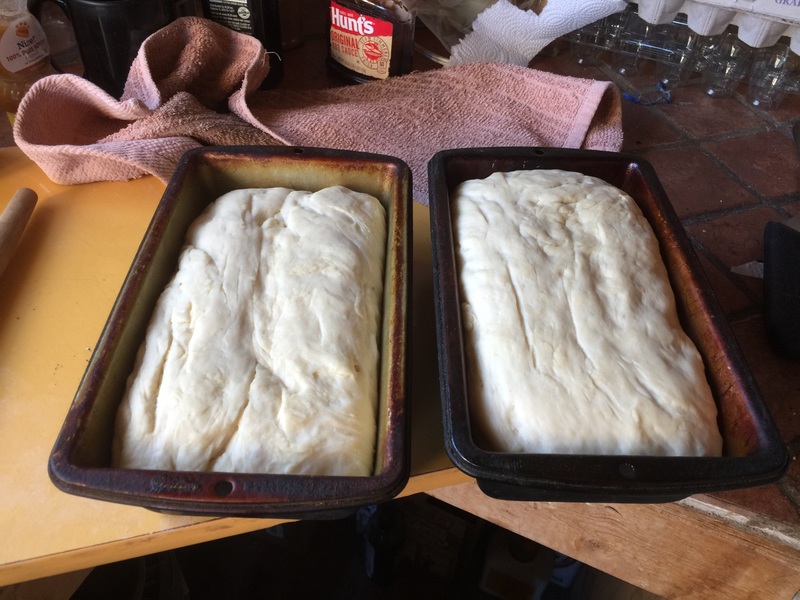 Joel, years back I stole your original recipe and tinkered with it until I had something that now has me responsible for bringing fresh bread to all family gatherings. In fact, your recipe is now known at least throughout my family as “Desert Hermit Bread”. Interesting to see how things have changed (your original called for milk and butter, and 1 more egg). The directions remained pretty consistent (then again, most bread follows the same rough path). One thing I’ve learned is that you get MUCH more consistent bread if you measure by weight instead of by cups/spoons. If you can scrounge up a small kitchen scale, I highly recommend.